In the 1950s, China established a regulation requiring that at least one room in each apartment receive a minimum of one hour of sunshine on the day of the winter solstice, December 21. Though well-intentioned, the rule resulted in wasteful use of scarce urban land. Planners applied the rule to government and enterprise housing built between 1950 and the mid 1980s. That housing, built during the pre-reform period, is still largely intact. So even though the rule no longer applies, its impact on the spatial structure of Chinese cities remains. At first glance, China’s sunlight requirement seems innocuous. Nobody can be against sunlight. For Marxist planners, replacing the messy and unpredictable outcomes of unfettered housing markets with scientific rationalism must have held strong appeal. 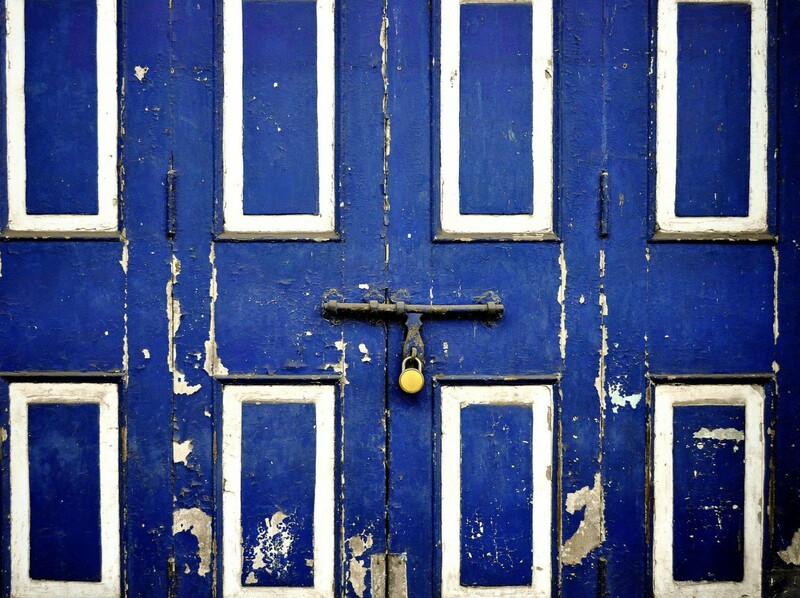 What’s more, a uniform rule for the entire country gives the impression of equality under the law. Every household would enjoy a minimum of one hour of sunlight every day, whatever their latitude. The rule boiled down to a simple mathematical formula: distance d between buildings is determined by the height of building h multiplied by the tangent of the angle α of the sun on the winter solstice at 11:30 in the morning using solar time. The regulation, expressed through a mathematical formula linked to the movement of the sun, appears to have scientific legitimacy. In reality, it was only pseudo-scientific. Though the height of the sun at noon is an indisputable fact, the notion that each apartment needs one hour of sunlight is hardly an established scientific necessity. Because of the “one hour of sun” rule, the distance between apartment blocks depended on a city’s latitude. Figure 1 illustrates the effect of the rule on the allocation of residential land at the latitude of Beijing. The requirement set the distance between buildings based on their height. Most housing blocks during China’s pre-reform era were 5 floors high. But the rule also fixed the ratio between floor space and land for every alternative number of floors. 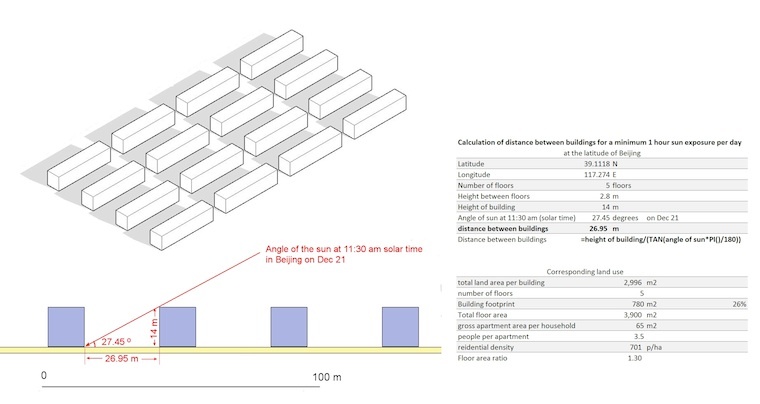 For a city at Beijing’s latitude, the table on Figure 1 shows the rule-based distance between buildings. By fixing the distances between buildings, the solar rule also constrained population density. If we assume gross floor space of 65m2 per household and we assume 3.5 persons per household, the rule implicitly mandates a residential density of 700 people per hectare. In addition, Figure 1 also shows also the predictable repetitive site plan that such a regulation produces—a scientific design rule inevitably results in uniformity. A more liberalized housing market, by contrast, results in individual design variety as each supplier tries to innovate to capture a larger share of consumer demand. The solar rule’s implications for urban form were staggering. First, for every location that shared the same latitude, the rule implicitly set the area of land consumed by each unit of floor space. For example, in the center of a city, one expects a unit of floor space to consume less land than a unit of floor space in the suburbs. But, at a given latitude, the solar rule meant that the area of land consumed by each unit of floor space was the same—whether a building was located in the center of the city or in a suburb, in a large city or in a small one. The rule also stipulated that more land should be used to produce one unit of floor space in northern latitudes than in southern latitudes. In other words, population densities should be lower in the northern Beijing municipality and higher in the southern province of Hainan. If the solar rule were applied to the United States it would prescribe that the densities of Chicago and New York should be much lower than those in Houston and Phoenix! When I was working on housing reform in China in the 80s, this rule was constantly cited when discussing the prospects for more efficient land use schemes. But was this design approach really followed in all housing projects in China? From a limited survey of sample site plans in Chinese cities—selected at various latitudes in Beijing (latitude 39.9 o N), Ningbo (latitude 29.9 o N) and Guangzhou (latitude 23.0 o N)—it appears that planners followed the rule fairly closely. Urban densities did indeed vary with the latitude: cities in lower latitudes had higher densities. It is interesting to note, however, that the rule was followed somewhat less zealously the further one got from the seat of government in Beijing. The table on Figure 2 shows the variations between the actual distance between buildings and the one specified by the solar rule. After the market reforms of the 80s, Chinese municipalities rapidly abandoned the allocation of land through design rules, replacing it with a more pragmatic approach that relied on market prices generated in auctions of land use rights. Because post-reform cities derived a large part of their revenue from selling land use rights to developers, they had a strong incentive to abandon rules that resulted in wasteful uses of urban land. But, in spite of its abandonment, the solar rule had an enormous impact on the structure of Chinese cities—the sort of unintended consequence that is too often typical of well-intentioned land use regulations. Tile image courtesy of Anne Roberts via Flickr.